Who wouldn't like to make their home healthier and more comfortable, while also winning major savings on electricity and heating fuel? That's right: You can eliminate the places in your home that are too hot or too cold at different times of the year. You can improve indoor air quality to make your house healthier. And (last but not least) you can reduce your monthly utility and energy expenses! Achieving these goals is a lot easier than many folks believe. It all starts with a home energy check-up, which is also referred to as an energy evaluation, assessment or audit. Dr. Energy Saver recommends an energy check-up for every house because like any good doctor, we know that it's malpractice to prescribe treatment before completing a thorough diagnosis of your home. Contact us today to begin your savings! Schedule a home energy audit in Cleveland, Akron, Canton, Lorain, Elyria, Massillon, Medina, Strongsville, Lakewood, Chagrin Falls, Cuyahoga Falls, Ravenna, Westlake, North Royalton, Bedford, North Olmsted, Painesville, Brunswick, North Canton, Alliance, Barberton, Wooster, Kent, Hudson, Gates Mills, Stow, Willoughby, Beachwood, and throughout Ohio. We are your trusted resource to understand the problem areas in your home and best way to fix them! A Dr. Energy Saver home energy evaluation provides you with a thorough analysis of all the systems and conditions that factor in your home's energy use. Conducted by certified energy analysts, this energy evaluation process involves a series of tests, inspections and calculations. During a blower door (or infiltrometer) test, you'll learn how much air leakage your house has compared to a similar house that has been air-sealed to recommended standards. Many houses leak twice as much air as they should, effectively heating or cooling your neighbor's yard! As the blower door's powerful fan depressurizes the house, you'll be able to see and feel where air is leaking from your home. Your Dr. Energy Saver "doctor" will also inspect insulation levels, ductwork, HVAC equipment, water heating and lighting. Special construction details --like crawl spaces, knee walls and living areas above a garage, for example-- will also get scrutinized because of their impact on comfort and energy efficiency. Get our free book, "Saving Energy and $ at Home" when you sign up for a Dr. Energy Saver Home Energy Audit. Call or email today to schedule your home energy audit. Once your home energy evaluation is complete, you'll be able to confer with your Dr. Energy Saver "doctor" and decide which energy-saving upgrades should be completed first. Just as medical prescriptions must be carefully checked for possible interactive effects, one energy-saving upgrade can have an impact on another. To get the most for your money, it's important to do the right things in the right order. Some energy-saving improvements will actually improve your home's indoor air quality. For example, leaky ductwork can actually cause your HVAC system to distribute air from crawl spaces, basements and attic spaces throughout your living area. These same leaks can cut your HVAC system efficiency in half. To stop breathing "bad" air and wasting energy, you may just need a single improvement from Dr. Energy Saver: duct sealing. Schedule a Home Energy Audit Today! Don't stay in the dark about your home's energy performance, especially when energy prices are certain to rise in the future. A home energy evaluation from Dr. Energy Saver will provide you with a clear path to improved comfort, lower utility and energy bills and a healthier home environment. Contact us today to schedule your home energy audit in Ohio. 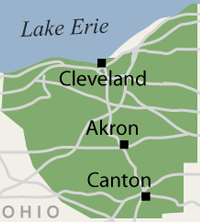 We proudly service throughout Greater Cleveland including Akron, Cleveland, Canton, Elyria, Lorain, Medina, Massillon, Lakewood, Chagrin Falls, Strongsville, Hudson, Cuyahoga Falls, Ravenna, Bedford, North Royalton, Westlake, North Olmsted, Wooster, Painesville, Alliance, Kent, North Canton, Beachwood, Barberton, Willoughby, Gates Mills, Stow, Brunswick, and all surrounding Ohio cities and towns.